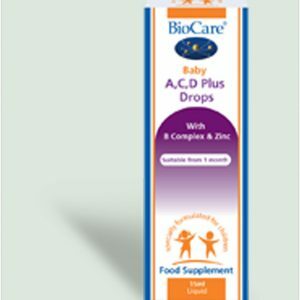 NEW Baby A, C, D Plus Drops contains key nutrients at levels suitable for babies from one month in an easy to use liquid form. Ingredients: Water, Fructose, Zinc Ascorbate, Vitamin C (as Calcium Ascorbate & Ascorbic Acid), Modified Tapioca Starch, Modified Corn Starch, Vitamin B6 (as Pyridoxine Hydrochloride), Niacin (as Nicotinamide),, ), Pantothenic Acid (as Calcium Pantothenate), Sucrose, Riboflavin (as Riboflavin-5-Phosphate Sodium), Vitamin A (as Retinyl Palmitate),, Sunflower Oil, Thiamine (as Thiamine Hydrochloride), Antioxidant (Natural Mixed Tocopherols), Vitamin D(as Ergocalciferol). Recommended Intake Eight drops daily or as professionally directed. Mix in milk, water or drop directly into baby's mouth. Suitable from one month. Shake well before use. 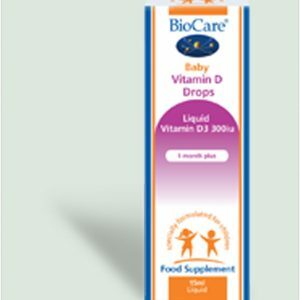 Baby Vitamin D Drops provides a vitamin D3 in a palatable, pure and simple olive oil base. It provides 300iu of vitamin D per daily intake (3 drops). Ingredients: Extra Virgin Olive Oil, Medium Chain Triglycerides, Vitamin D3 (as Cholecalciferol), Antioxidant (DL-Alpha Tocopherol). Recommended Intake Three drops taken daily in water, juice or milk, with food, or as professionally directed. Shake well before use. Suitable from 1 month. 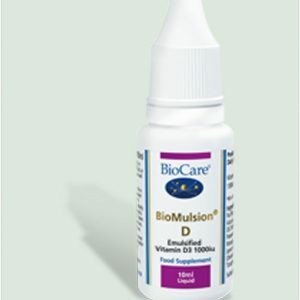 BioMulsion® D is a potent liquid vitamin D supplement that is emulsified for maximum absorption and superior bio-availability. It provides 1000i.u. Vitamin D3 per daily intake in a palatable lemon flavoured liquid. Ingredients: Purified Water, Fructose, Acacia Gum, Extra Virgin Olive Oil, Medium Chain Triglycerides, Natural Lemon Oil, Preservatives (Citric Acid & Potassium Sorbate),, Vitamin D3 (as Cholecalciferol), Antioxidants (DL-Alpha Tocopherol & Natural Mixed Tocopherols), Sunflower Oil. Recommended Intake One drop taken daily in water, juice or milk, and with food, or as professionally directed. Shake well before use. 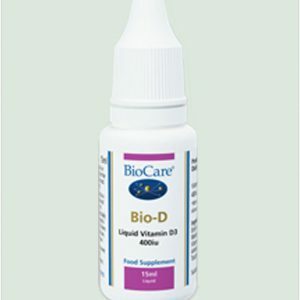 Bio-D is a liquid vitamin D supplement providing 400i.u. of Vitamin D3, cholecalciferol per daily dose in a simple olive oil base. Ingredients: Extra Virgin Olive Oil, Medium chain Triglycerides, Vitamin D3 (Cholecalciferol), Antioxidant (DL-Alpha Tocopherol) Recommended Intake Four drops taken daily in water with food, or directly under the tongue, or as professionally directed. 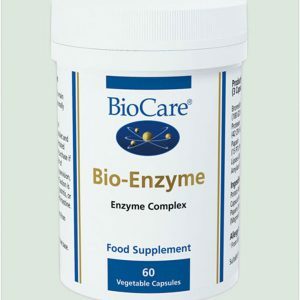 Bio-Enzyme is a combination of biologically active enzymes which are able to survive the acidic conditions in the stomach. Suitable for vegetarians and vegans. Ingredients: Potato Maltodextrin, Bulking Agent (Cellulose), Capsule Shell (Hydroxypropyl, methylcellulose), Papain, Bromelain, Protease, Anti-caking, Agent (Vegetable Magnesium Stearate), Lipase, Amylase. Recommended Intake One capsule taken with each main meal (3 times daily), or as professionally directed. 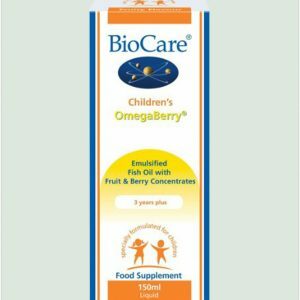 Children's OmegaBerry® is an emulsified fish oil with tropical fruit & berry concentrates, making it an optimally absorbed and great tasting source of omega-3 fatty acids for the whole family. Ingredients: Fish Oil Concentrate1, Concentrated Pineapple Juice, Modified Corn Starch, Fructose, Water, Wild Berry Concentrate, (Blackcurrant, Elderberry, Blueberry, Chokeberry & Apple), Concentrated Orange Juice, Mango Puree, Banana Puree,, Alginate, Pineapple Flavour, Acacia Gum, Antioxidant (Natural Mixed Tocopherols2), Vanilla Flavour, Sunflower Oil,, Preservative (Potassium Sorbate), Citric Acid, Ascorbic Acid. Recommended Intake For children between 3 - 5 years, half a teaspoon daily (approx 2.5ml), and for children 5 years and over, one teaspoon daily (approx 5ml), or as professionally directed. Shake well before use. For adults one teaspoon (approx 5ml) taken twice daily with food or as professionally directed. 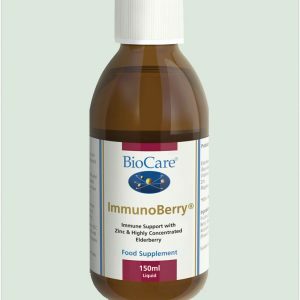 An immune support formulation with highly concentrated Elderberry and Zinc. A delicious fruity liquid is a perfect winter supplement for adults. Children's Elderberry Complex is also available. Ingredients: Fructose, Elderberry Concentrate (Sambucus nigra Berry), Water,, Glycerol, Acacia Gum, Zinc Gluconate, Preservative (Potassium Sorbate). Recommended Intake One teaspoon (5ml) taken twice daily with food, or as professionally directed. 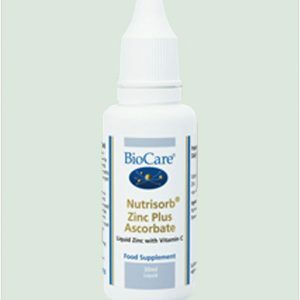 Nutrisorb Liquid Zinc Plus Ascorbate is a highly absorbable, liquid zinc combined with vitamin C which can be taken under the tongue or in drinks. 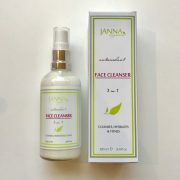 Ingredients: Purified Water, Zinc Ascorbate, Preservative (Ascorbic Acid). Recommended Intake 10 drops taken daily in water with food, or directly under the tongue, or as professionally directed. Vitasorb® B12 provides Vitamin B12 in a highly absorbable, liquid form . Vitamin B12 contributes to the normal functioning of the nervous system, metabolism, psychological function as well as contributing to the reduction of tiredness and fatigue. Ingredients: Purified Water, Preservatives (Citric Acid & Potassium Sorbate), Vitamin B12 (as Hydroxycobalamine), Recommended Intake Five drops twice daily in water with food, or directly under the tongue, or as professionally directed. 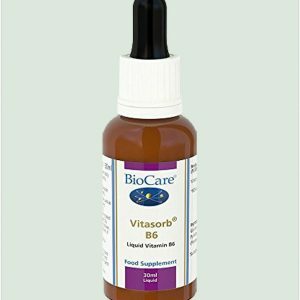 Vitasorb® B6 provides Vitamin B6 in a highly absorbable, liquid form. Vitamin B6 contributes to many functions such as normal functioning of the immune and nervous systems, energy metabolism and reducing tiredness and fatigue. Ingredients: Glycerol, Purified Water, Vitamin B6 (as Pyridoxine Hydrochloride), Preservative (Potassium Sorbate), Recommended Intake Ten drops taken daily in water with food, or directly under the tongue, or as professionally directed. 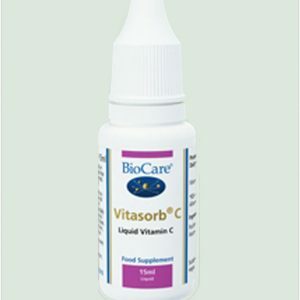 Vitasorb® C is a liquid vitamin C preparation providing 30mg per daily intake in a simple, hypoallergenic purified water base. Vitasorb® C is a highly absorbable liquid preparation that can be mixed into juice, milk or water. Ingredients: Purified Water, Vitamin C (as Ascorbic Acid). Recommended Intake Four drops taken daily in water with food, or directly under the tongue, or as professionally directed.